Think of Jaipur and a visual kaleidoscope jumps to mind: its massive forts and royal palaces, ancient temples and traditions, uncut diamonds and precious gems, bazaars filled with handicrafts alongside modern stores with contemporary designs …. and that’s just to name a few! In time I’d like to explore them all, but today’s post is dedicated to a list of 30 places to shop which make for a great induction to Jaipur’s best design & its authentic luxe. In a quest to find stores which do justice to Jaipur’s legendary love affair with Design and authentic luxe, I recently decided to spend an extended weekend exploring Jaipur’s shopping scene : from hip boutiques to heaving bazaars to zen-like designer ateliers. The constraint I put on self was to handpick stores which create or stock exquisite objects that transcend borders and have a deep understanding of their craft enabling them to add fresh perspective to ancient traditions. Apart from my own research I had the privilege of insider lists from my friends – Priya Kapoor and Malvika Singh in particular – who are both champions of authentic ‘cool’ and visit Jaipur regularly, making my pre-visit shopping list for Jaipur as expansive and discerning as possible. After visiting many (many!) shops which resulted in a rather long list, it took some time to distill the list to 30 shops each of which promise modern design sensibilities and exquisite craftsmanship. Since I visited Jaipur only a couple of weeks ago, this may be the most updated list of best of Jaipur shopping in January of 2017. CMYK is a beautiful designed souvenir store filled with a tightly curated selection of stationary, postcards, music CDs, fashion accessories and easy-to-carry-home gifts. Especially love: Postcards, many of which are designed exclusively for CMYK stores and drool-worthy selection of coffee-table books. A stunning display of varied selection of block-printed textiles housed in a beautifully restored old haveli – Anokhi Museum to my mind is one of India’s best small museums . There is a cafe too – a perfect little spot to put your feet up, write your diary or simply take-in the sights and sounds of rural Jaipur. Especially love: Some of the merchandise available at the museum store is exclusive and may not be available at other Anokhi stores. 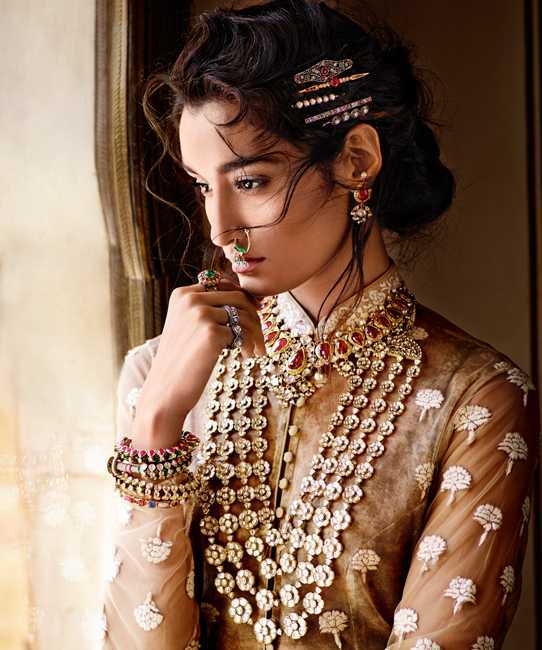 Brigitte Singh’s Mughal inspired, hand printed designs and impeccably finished textile lengths/ garments are legendary. 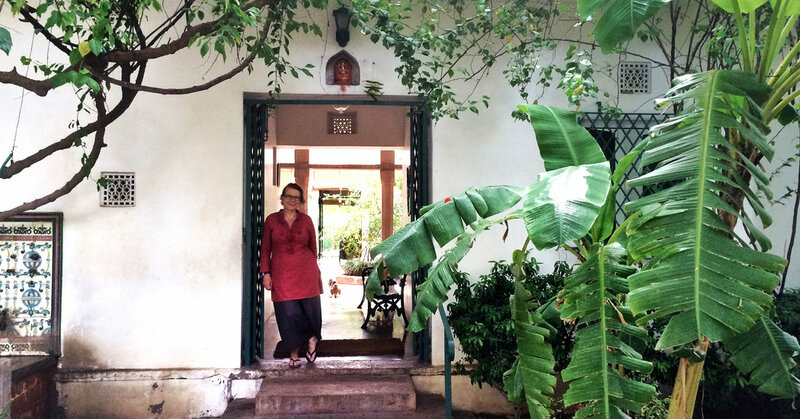 Her studio, in Amber town, is a bougainvillea-covered haveli hidden behind huge emerald green gates where visitors can shop as well as watch artisans at work . Visits are by appointment only. Especially love: In addition to the beautiful textiles, the haveli itself – outfitted with a thoughtful collection of interesting furniture, objects and arts – is a treat for the senses. The owner & designer of Satayam uses India’s rich weaving and block-printing traditions to create finely woven shawls, modern garments, and hand-stitched quilts. Especially love: Handspun and Tie & Dye Beach towels, Woollen shawls created using mud resist technique and cotton shawls with gold leaf work. Also, Cotton Oxford shirts with sterling silver buttons is a fine choice for the Mister. Sanyukta Singh’s apparel and accessory store at Alsisar Haveli has a curated collection of accessories for women and children, handpicked pieces of semi-precious jewellery from local designers, multipurpose antique boxes, rustic table fans, vintage Indian perfume bottles, tribal inspired art, amongst a range of period furniture pieces. Especially love: Mul block printed kurtas and Ikat collection of open sandals. Kasliwals, the owners of Gem Palace, have been jewellers since the 9th century and were invited to set-shop in Jaipur by the Royal family. Famous world-over for quality and craftsmanship, Gem Palace has been the jeweller of choice for many a Royals, collectors and celebrities. Especially love – Munnu: The Gem Palace – a glittering atelier in tribute to the Late Munnu Kasliwal who was responsible for some of its most inventive & opulent designs. Note: Atelier visits are by invitation only, but Victoria and Bertie Dyer of India Beat do a Jaipur shopping tour which includes a visit to this atelier. I’ve loved Amrapali forever. This homegrown Jaipur jewellery brand is best known for its Polki (uncut diamond) jewellery, but also has an equally a large and fantastic variety of gold temple jewellery, antique tribal silver amongst other collections which range from modern to traditional and simple to glamorous. Established in 1880, the current owners are the fifth generation of brass artisans in the family. Known mostly for the exquisite filigree work on metal, they sell superb hand-engraved, enamelled, and embossed brassware. Purchases are shipped anywhere in the world. Especially love: Their oversized trays, historic armour, and antique brassware. My favourite thing to do around Hawa Mahal is to take a walk into the bazaars, which are all in the vicinity and part of the old walled city. Its crowded, chaotic and is best seen with locals – whether they may be a friend or a guide. Unless you’re only looking to feel the vibe and take some Instagram-worthy pictures, be prepared to bargain – and bargain hard. Rana Sarees has been in business for over 170 years and has a huge variety of sarees especially Leheriya, Tie & Dye and Gotapatti sarees which are traditional styles of Jaipur / Rajasthan. My favorites here are Gota Patti sarees with Marodi work. Not too far from Manihaaron Ka Raasta is the 200-year-old Rajasthan Trunk Company which makes and sells rather inexpensive and surprisingly light-weight, polished metal trunks in every imaginable hue. Priced at 500 to 2,000 rupees these trunks are rather popular with rural Rajasthani customers who come to buy trunks which match the colour of their trousseau. One of India’s leading design and lifestyle store, Good Earth is best known for its ability to use exquisite materials in designs which combine varied Indian crafts with modern sensibilities. A visit to Kashmir Loom is a study in modern artisanal Kashmiri embroidery & pashma. And my ‘go-to’ place in India to buy Cashmere. Until recently Kashmir Loom mostly exported its creations to top international brands and only just formally entered domestic market with its retail store at The Raj Mahal Palace. Especially love: Kani, the the heavily embroidered wall-tapestries : every one of these takes years to complete. These are heirloom pieces and I am certainly saving for one. Jaipur Modern is an interpretation of Indian Crafts for a design-sensitive, discerning, citizens-of-the-world audience. Set in a beautiful 1920s bungalow, with dramatic black-and-white marble floors and inlaid tables Jaipur Modern is a multi-brand store for home accessories, clothes and jewelry. Teaotro Dhora is a wonderful melting pot of some of India’s best (mostly young) craft designers. A space where art meets art lovers, the store is beautifully curated space and stocks a varied collection of objects – including furniture, fine art, apparel, and home decor. A lovely store for blue pottery typical of Jaipur, Neerja has a large selection of lamps, vases, doorknobs and crockery. There are also some mirrorwork frames and costume jewellery on display. Award-winning artist Tilak Gitai creates exquisite miniature paintings in classic Mughal, Rajput, Pahari styles using colors made from semi-precious stones and embellished with real silver / gold leaf on antique paper. An almost hundred-year-old enterprise and a household name for soft furnishings in Jaipur has a wide range and beautiful range of bed and table linen, cushions and curtains. Rahul & Shikha of Vrisa are combining age old Indian textile crafts with a variety of cuts, patterns, and embroideries to create urban & modern collections. All clothes at Vrisa are handmade, making each piece unique. About 20 minutes’ drive from Jantar Mantar / Albert Hall Museum / Rambagh Palace is ‘the’ hotspot of Jaipur Shopping with some of the coolest designers who’ve set shop in the sprawling gardens of the Narain Niwas Palace. Highly recommend spending a few hours in the shops followed by one, (or many) drinks at the beautifully designed Bar Palladio which opens at 6.30pm every evening. Jaipur’s own Ayush Kasliwal is, to my mind, one of India’s best contemporary furniture designer. He and his team of designers collaborate with master artisans of Indian crafts to create luxury, contemporary home products. At their store at Narain Niwas there is also a collection of some interesting costume jewellery designs. Especially love: Cloud Shaped stools which are multi-functional and fabulous. A wide collection of clothes, scarves, bags from some of India’s hottest designers everything at Hot Pink is handpicked for a globe-trotter. Created by French designer Thierry Journo, has an interesting collection of Indian inspired but European designed apparel for men and women and some very cool home accessories. Owned and run by two personable Kashmiri brothers, Andraab has a fantastic collection of scarves, wraps, and bedspreads, all made of the finest cashmere. Hop, skip and jump from Narain Niwas is Zari Jaipur. It wasn’t on my pre-visit list but I was pleasantly surprised to have bounced upon this huge, five story store selling Indian formal wear embellished with Zari (silver filigree embroidery). Their bridal section was quite impressive. 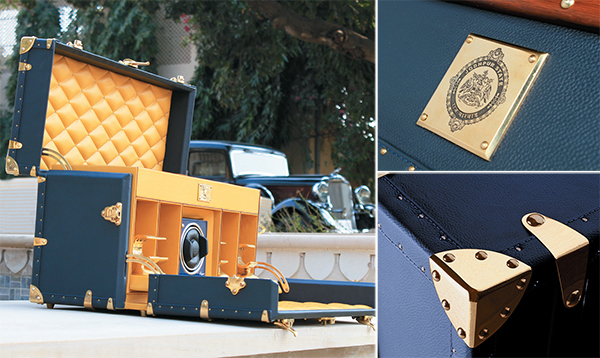 Out of the way and middle of nowhere but if Bespoke Trunks or Woven Rugs is your thing, these two are really worth the tedious drive..
Best known for their bespoke trunks made from Italian leather, French hardware and German casters Trunks Company is a dream come true. The store has built trunks for storing everything — from a minibar to hats and sunglasses or anything else you may wish to store in this suede lined beauties. Winner of several Indian and International Design Awards, and one of India’s truly global brands, Jaipur Rugs has a fantastic and extensive collection of Classic, Flat Weaves, Modern, Overdyed, Solids, and Transitional designs, many of which have been created in collaboration with renowned international designers. 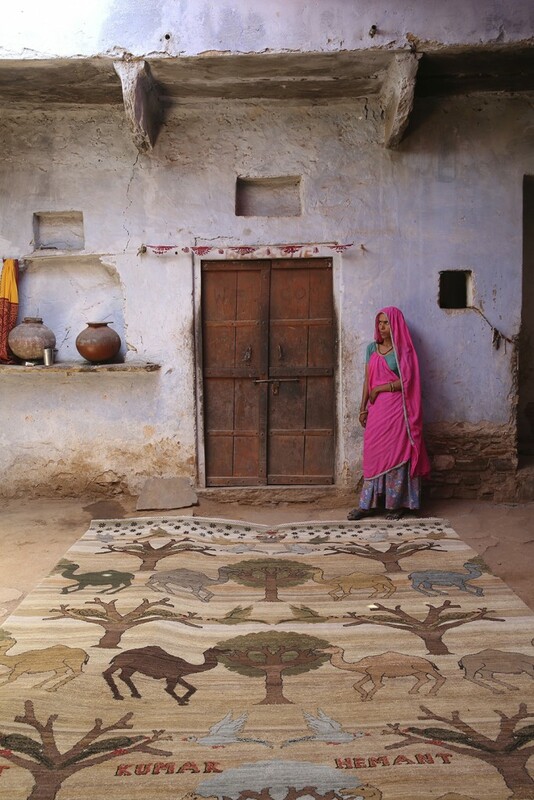 Especially love: The Artisans Collection where artisans use their own inspirations and designs to make the rugs. Made ingeniously, each of these reminded of rustic earth, unpretentious design which is inspired by nature and rural surroundings. ’Antarag’, a rug from this collection recently won German Design Award 2016 for Material and Surface Category. In a city which is constantly evolving and full of hundreds of exciting options, there must be a gem or two that I’ve missed and yet, I hope this handpick selection would still be a great start to a curated tour of your Jaipur shopping. Raising my glass to new (and amazing) acquisitions, curated living & authentic luxe…. Aesthete. Storyteller. Wanderer. Chanda is a lover of design, craftsmanship and individualistic style. She’s best known for hosting long champagne lunches filled with stories and tales of adventure, living life on her own terms and making the ordinary, extraordinary. She lives and works in Goa, India.